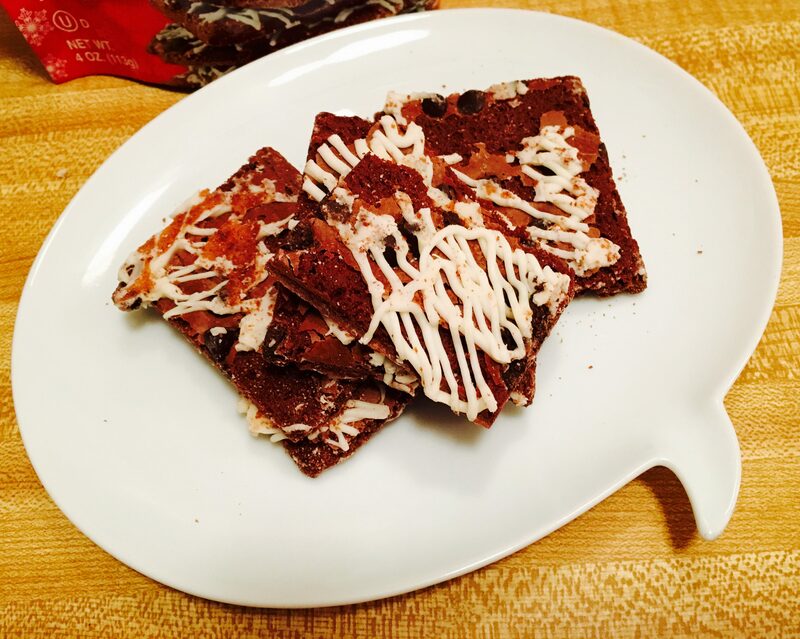 Tasty Holiday Treat: Salted Caramel Brownie Brittle! With the Holiday season fast approaching, the time is now for guilty pleasures and dietary indulgences. 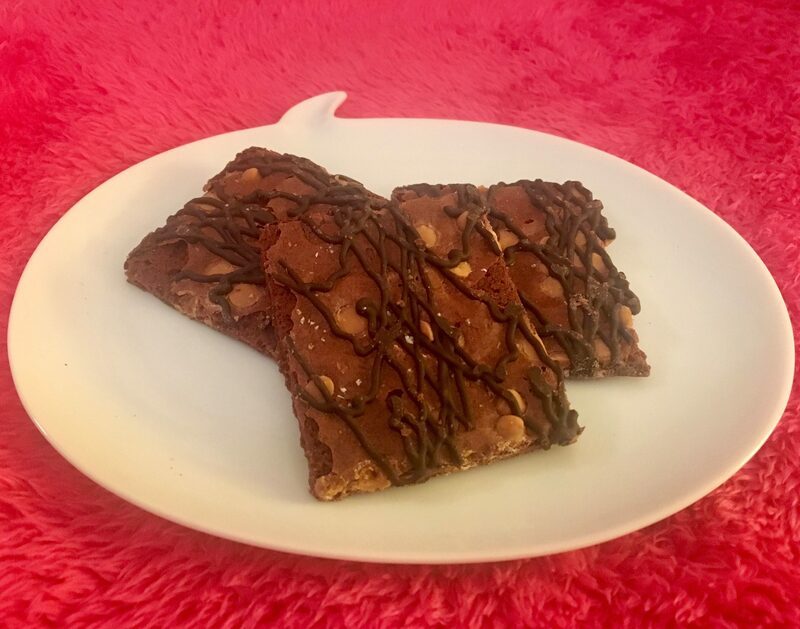 Fans of this blog know well my love of the decadent sweet treat called Brownie Brittle — an oven-baked brownie-thin with a crisp cookie crunch. OMG, this stuff is delicious. 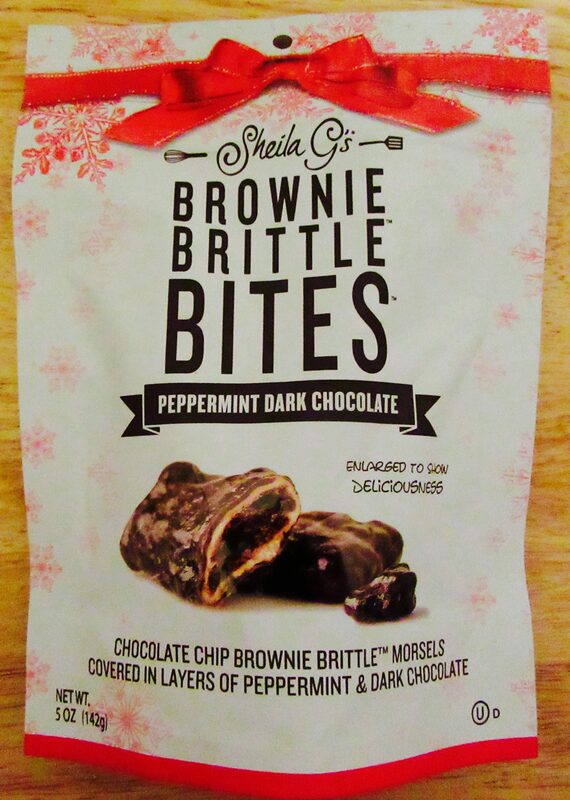 In honor of what I like to call the Holidaze, Brownie Brittle reintroduces flavors that are available only during theses chilly months, and tarts-up their packaging with snow flakes and bows so that you can grab a few bags for last minute gift giving! Convenient! 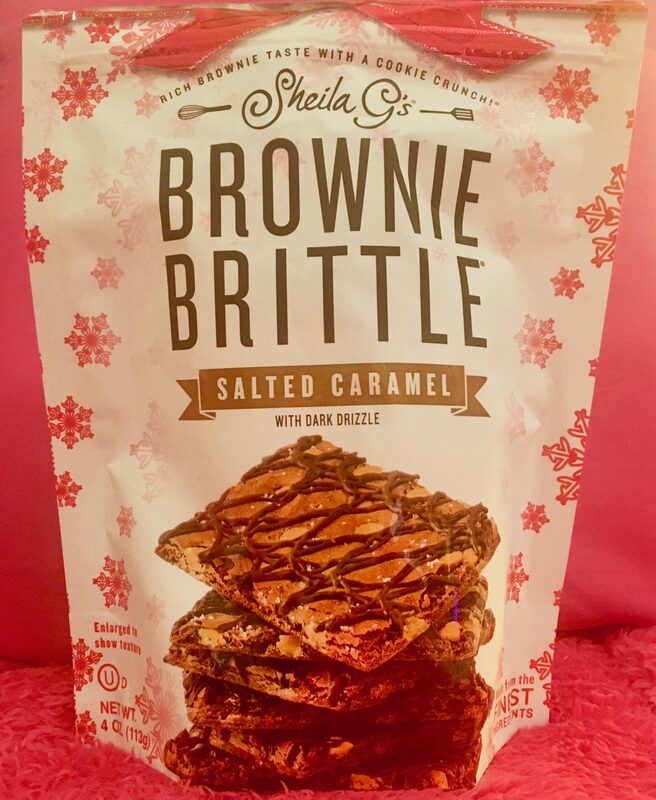 With a narrow window of availability to purchase Brownie Brittle’s holiday varieties, I want to make sure you try what is not only my favorite flavor, but the favorite of Brownie Brittle originator herself, Shelia G — Salted Carmel Brownie Brittle! The salted caramel chocolate treat remains very much on-trend, and Brownie Brittle leads the charge this Holiday season with its Brownie Brittle that is liberally studded with velvety Caramel Chips, and topped with a Dark Chocolate Drizzle — for added festiveness! Something I learned from watching too many baking shows is that adding salt to chocolate does not make the treat taste saltier. Rather, salt enhances the flavor of the chocolate, and makes it taste like the most delicious thing on earth. 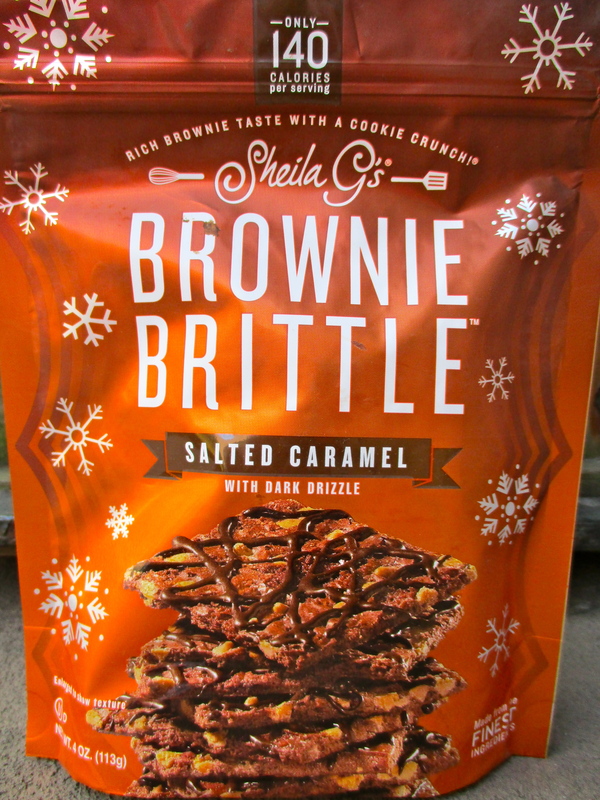 Warning: Salted Caramel Brownie Brittle is highly addictive! I recommend that you take a few pieces out of the bag, put them on plate, and then take that to the TV room or wherever you are going to have your snack, leaving the sealed bag behind you in the kitchen. so that you don’t lose control. 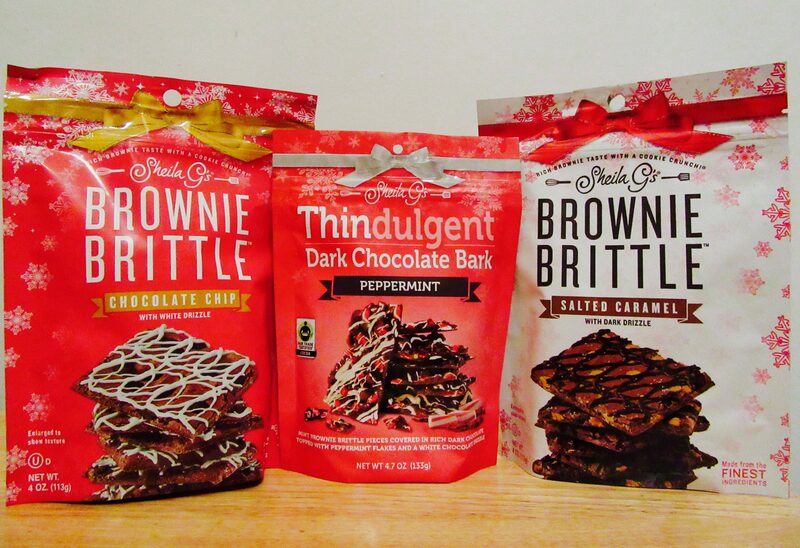 Shop for all varieties of Brownie Brittle at your local supermarket, or online at This Link! 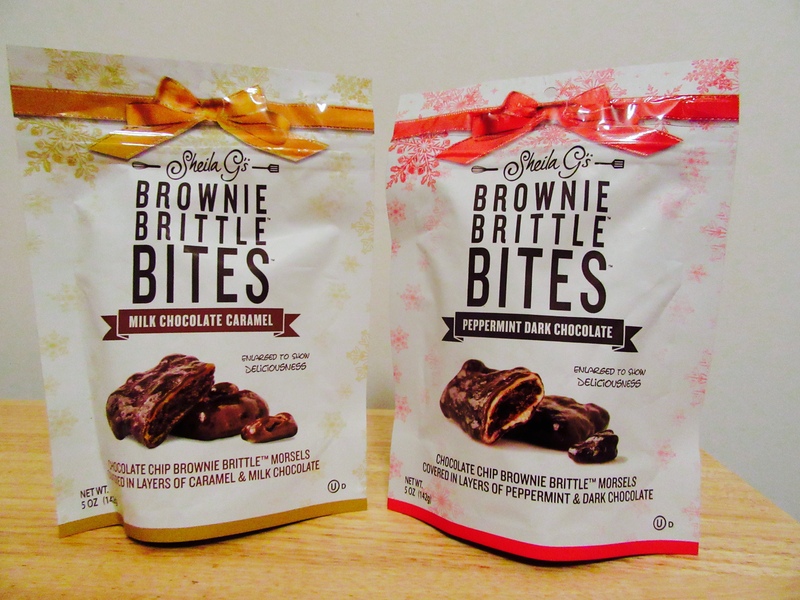 Brownie Brittle: New Holiday Varieties Are Here! 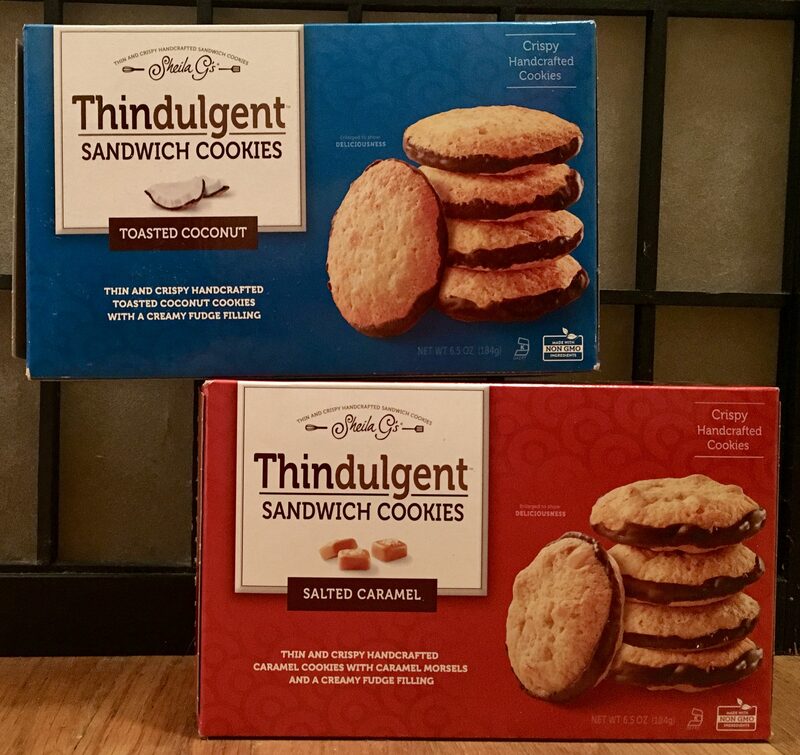 Do you have a favorite snack that tastes so delicious, you literally cannot believe how good it is? And maybe you buy a bag of that snack, and sit with the entire bag in your lap and just eat and eat until there’s nothing left in the bag except crumbs, but then you pour the crumbs out of the bag into your hand and lick them off of your palm? Don’t act like you don’t know what I’m talking about. For me, the sweet snack that makes my head explode is Brownie Brittle, which I first discovered at a food show about three years ago. If you are not yet hip to the Mother of all Sweet Snacks, let me explain that Brownie Brittle is a cookie-like baked treat that tastes like the well-done edges of the Brownie where the batter meets the pan. 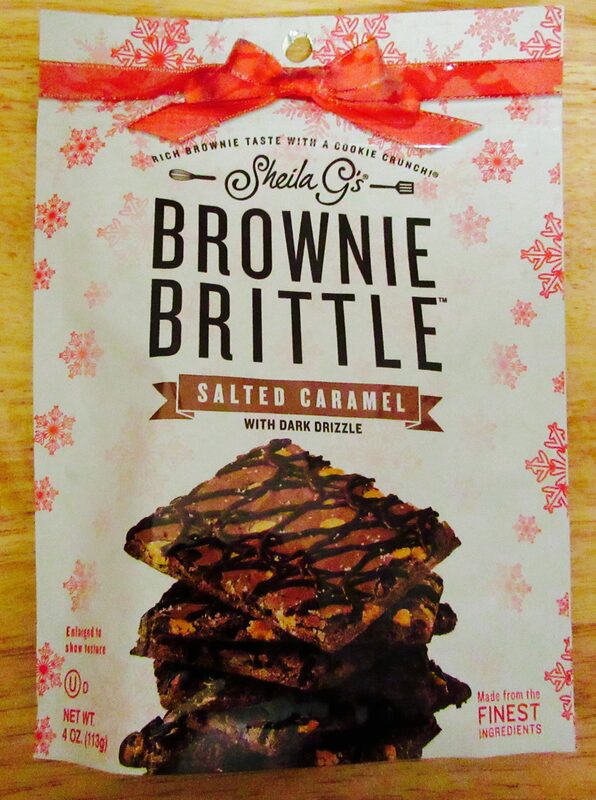 There are a few lame imitators out there but Sheila G’s Brownie Brittle is the original, and it is just insane. The salted caramel chocolate treat is still very much on-trend again, and Browne Brittle leads the charge this Holiday season with its Salted Caramel Brownie Brittle with a Dark Chocolate Drizzle — for added festiveness! Some of you may not know that adding salt to chocolate does not make the treat taste saltier, but rather it enhances the flavor, and makes it taste like the most delicious chocolate on the planet. I brought a bag of Salted Caramel Brownie Brittle to the office to share with my team, and not only was it was devoured within minutes, but my co-workers simply would not shut up about how amazing it was. They are still talking about it. Chocolate Chip Brownie Brittle — a year-round favorite — gets all dressed up for Santa with the addition of a little sweet white drizzle on top. Check it out! 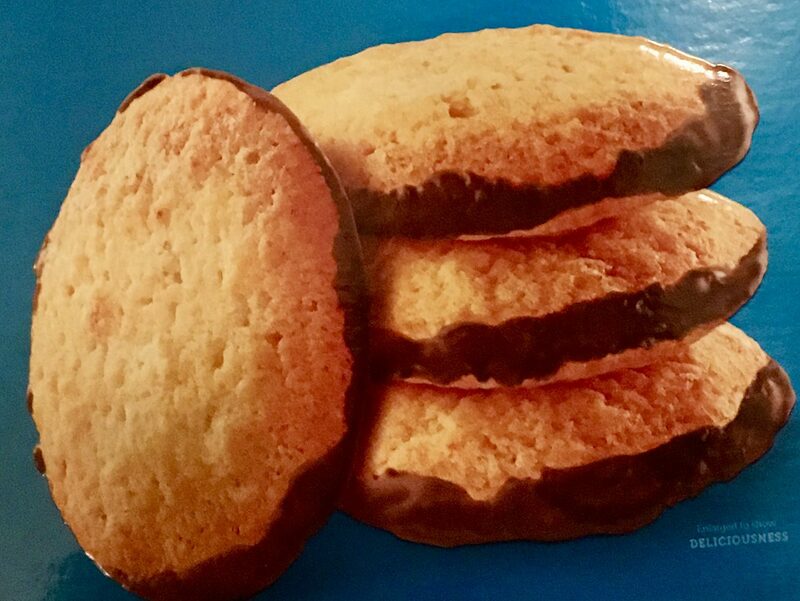 This particular variety of crunchy, chocolaty goodness is really special when broken up over a dish of ice cream with maybe some Trader Joe’s frozen cherries tossed in for good measure. Yummy. 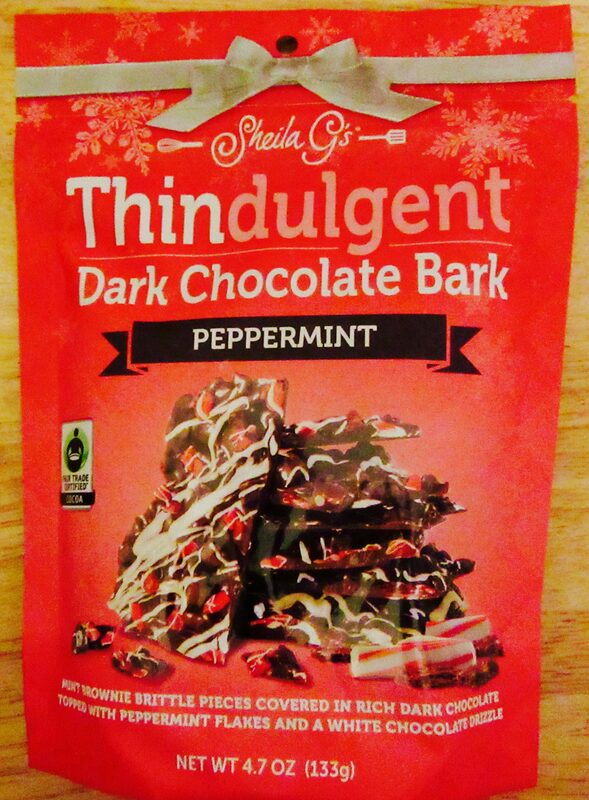 Things start to get a little crazy with what they are calling Thindulgent Dark Chocolate Bark, which is Mint Brownie Brittle pieces covered in dark chocolate, topped with peppermint flakes and a white chocolate drizzle. Sassy! Bring this to the Holiday Party and make lots of friends! 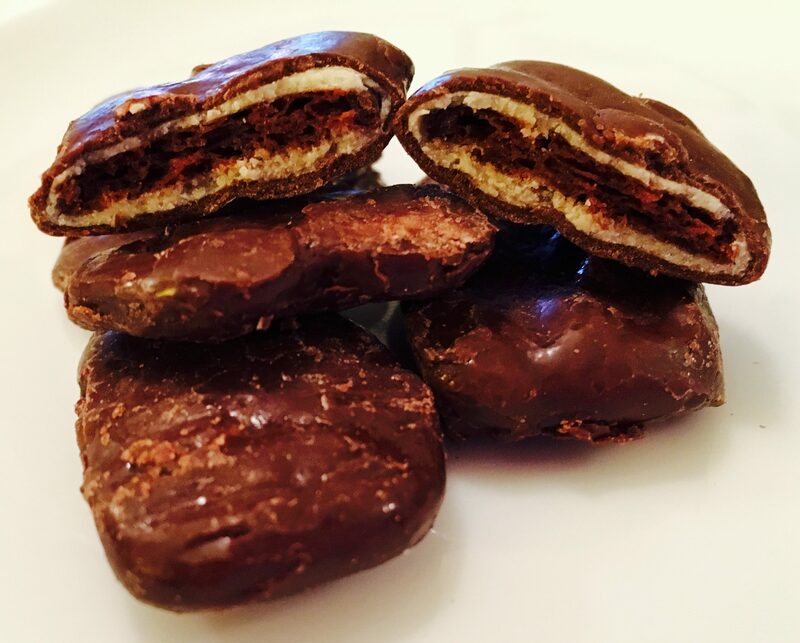 Also brand new this year are Brownie Brittle Bites, which combine the best parts of candy and cookies all in one outrageously indulgent morsel. Kill me! 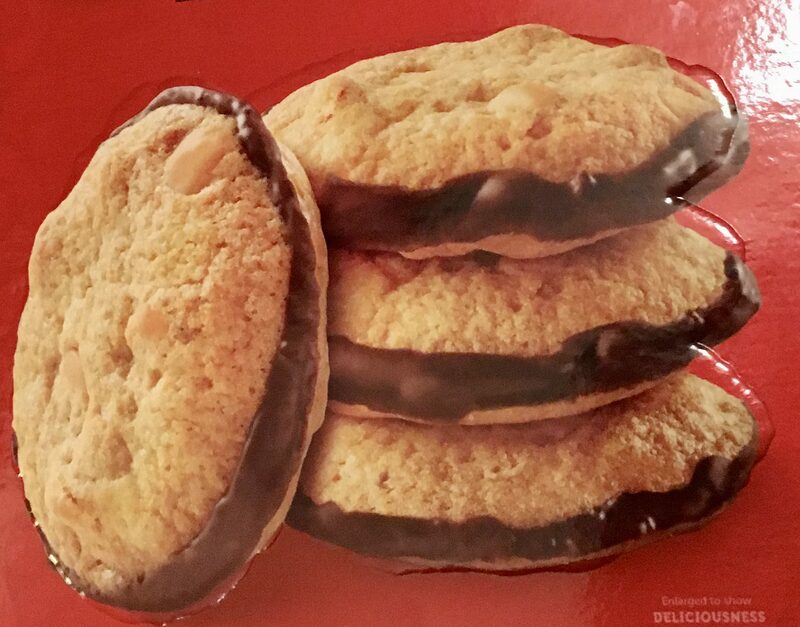 Imagine Junior Mints wrapped around layers of crunchy Chocolate Chip Brownie Brittle and you get the idea. Verdict: Out of Control. 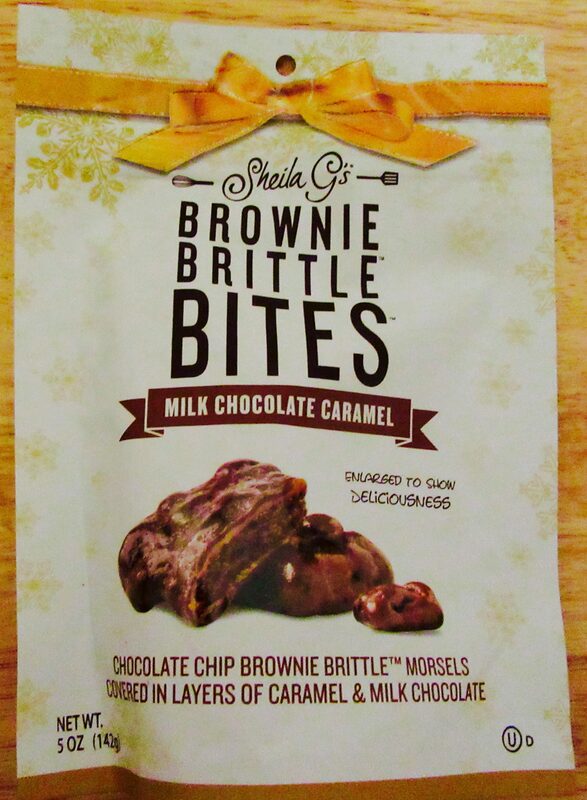 Brownie Brittle Bites also come in Milk Chocolate Caramel in case you do not have diabetes yet. All of these varieties of delicious Brownie Brittle cone in a festive resealable, snowflake-print pouch, with bow on it and everything, so you don’t even need to wrap it! 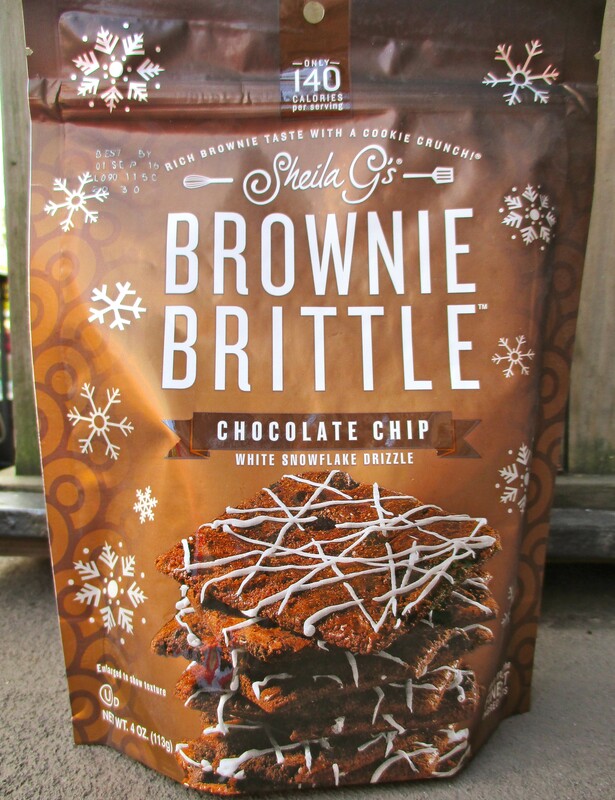 Find a store near you that sells Brownie Brittle, or buy it online, at This Link! 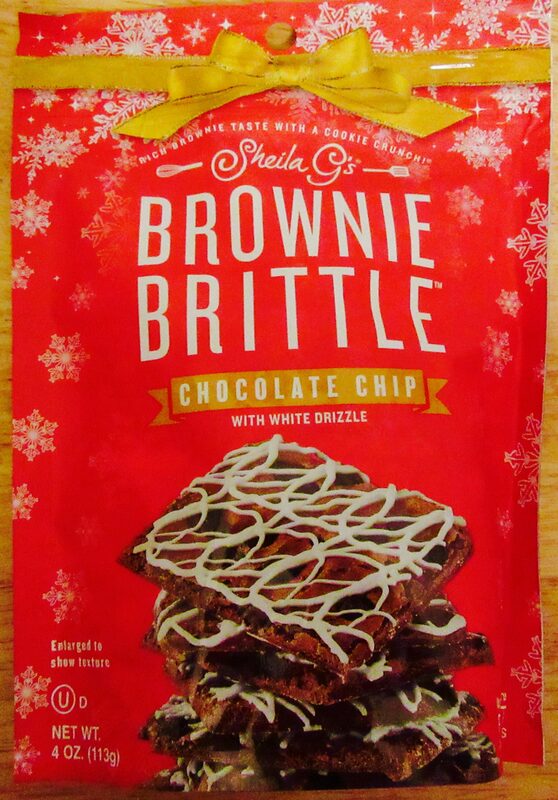 Product Review: Brownie Brittle Holiday Drizzle Varieties! Do you like Brownies? I sure do. While there is no ‘bad’ part of a delicious brownie, my favorite part is the crispy edge from where the brownies bake right up against the side of the pan. Yummy. Like the well-done end bits of a really fine brisket, it is the part that every Brownie Lover fights over, whether or not they will admit to it. 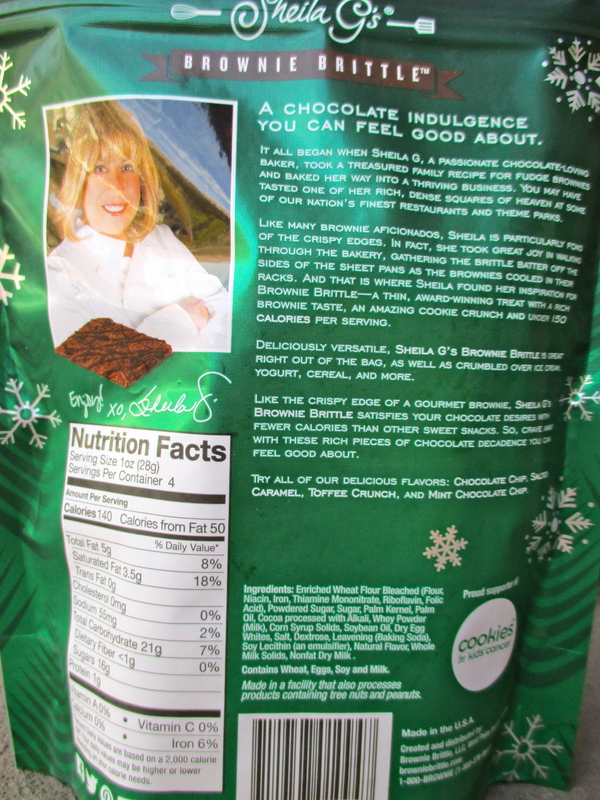 Fortunately, Brownie Entrepreneur Sheila G. Mains feels as I do, and has put an end to the fighting with her genius creation of Brownie Brittle. 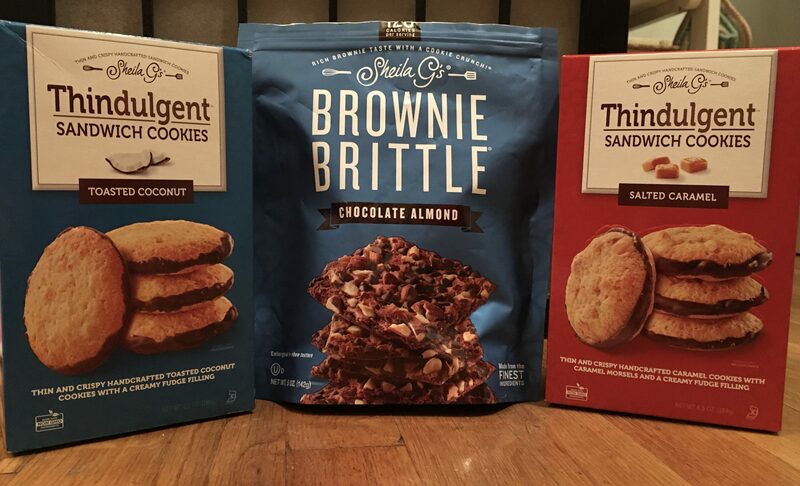 I was first introduced to Brownie Brittle at the Summer Fancy Food Show a couple of years back, and it immediately became my favorite product of the show, as it is surely one of the most delicious things you can put in your mouth. 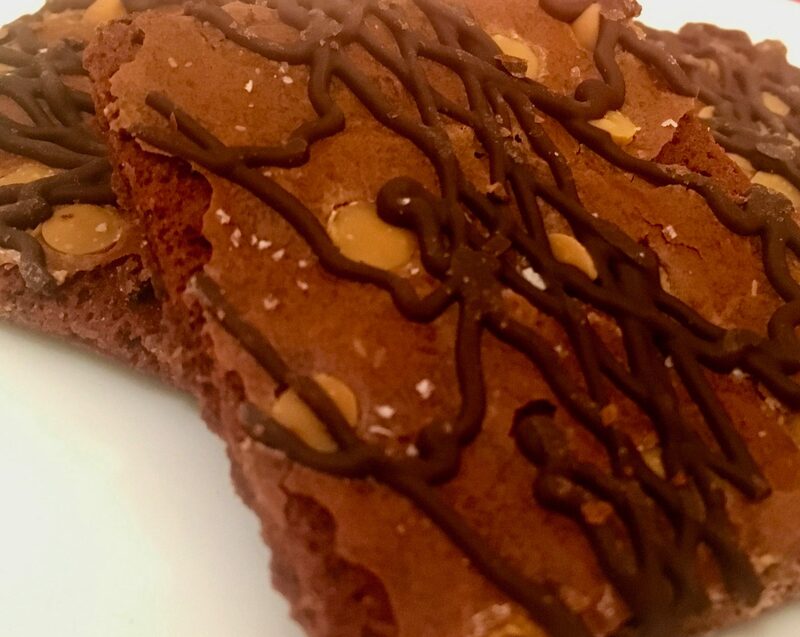 Boasting “Rich Brownie Taste with a Cookie Crunch,” Brownie Brittle is an indulgent, wafer-thin and ultra-crispy Chocolate Brownie snack that comes in four varieties and just keeps winning with its ridiculously low calorie count of only 140 per serving! Insane! 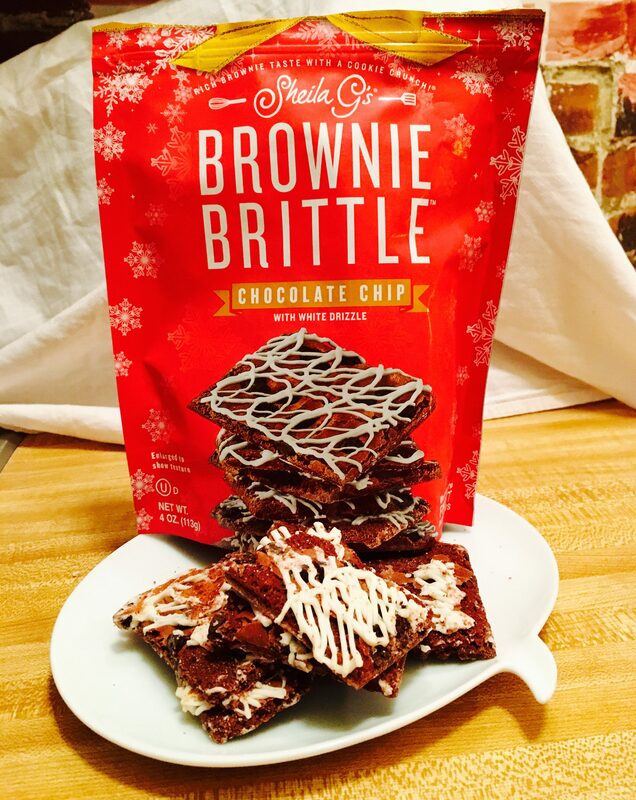 And if you thought it could not get any better than that, Brownie Brittle has introduced a new, seasonal Holiday Drizzle collection that combines sweet decadence with a touch of festive cheer! The four-ounce, snowflake adorned bags include flavors like Chocolate Chip with White Snowflake Drizzle, and Salted Caramel or Mint Chocolate Chip — both with a Dark Chocolate Drizzle. 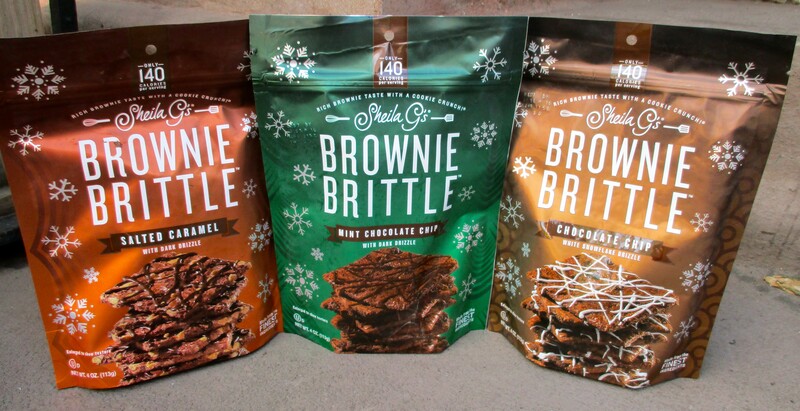 Brownie Brittle’s new holiday flavors retail for just $3.99 per bag. 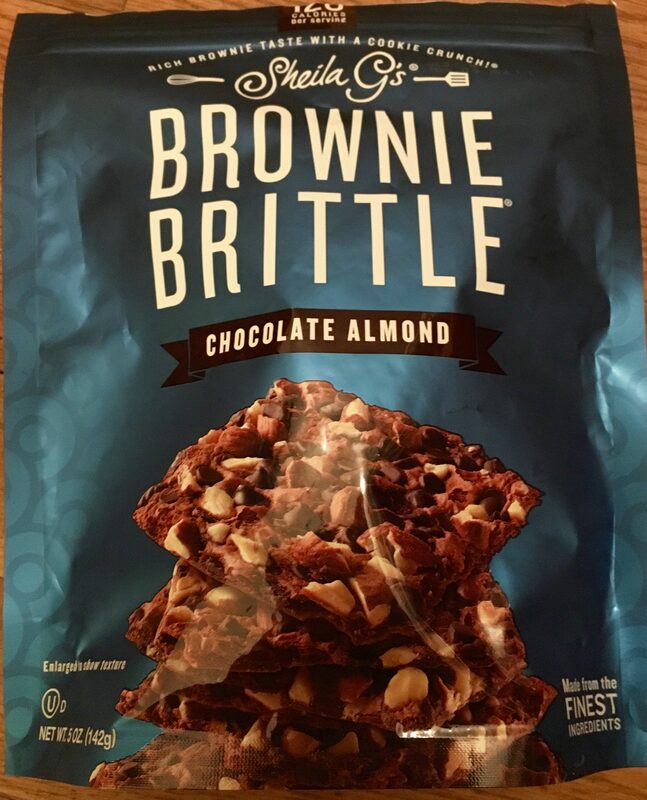 I have taken Brownie Brittle to share at parties, and offered it as a snack to friends visiting my home, and everyone always asks if they can just have the entire bag. Not even kidding. That is a testament to how irresistible Brownie Brittle is! 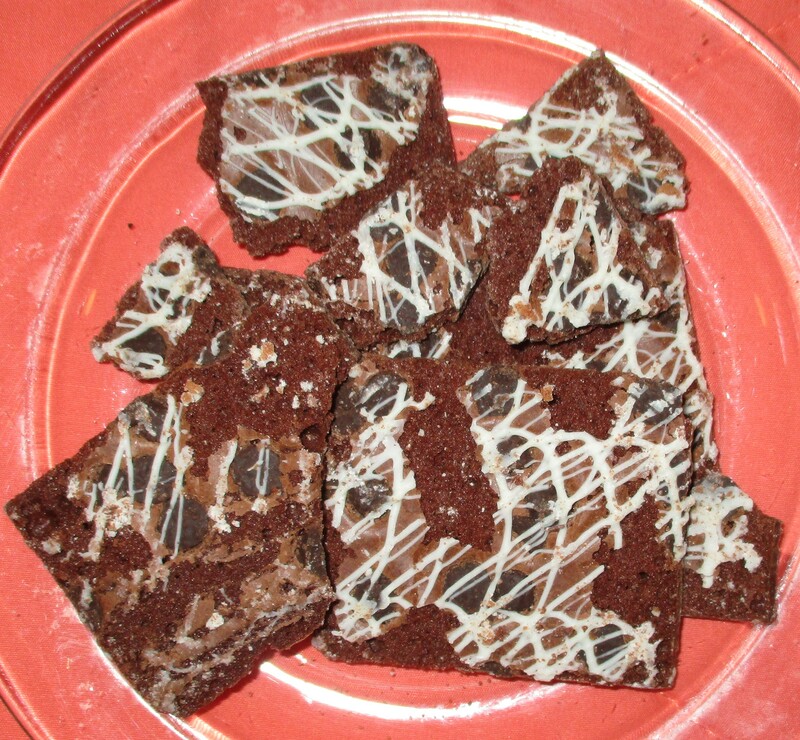 Learn more about Brownie Brittle and find a store that sells it in your neighborhood, at Brownie Brittle Dot Com!